The Senators’ brand of hockey, a 1-3-1, neutral-zone clogging formation that forces the puck out wide and limits odd-man rushes at both ends of the ice, is aesthetically unappealing, to the point where you find yourself rooting against them in the postseason just so you don’t have to watch them anymore. But it’s undeniably effective, having taken Ottawa to within a game of the Stanley Cup final, and it’s a showcase for Erik Karlsson, the best defenseman on earth. If you don’t want to imagine the Senators without Karlsson, well, the Sens would wholeheartedly agree with you. But that’s how it’s going to be for at least a little bit. 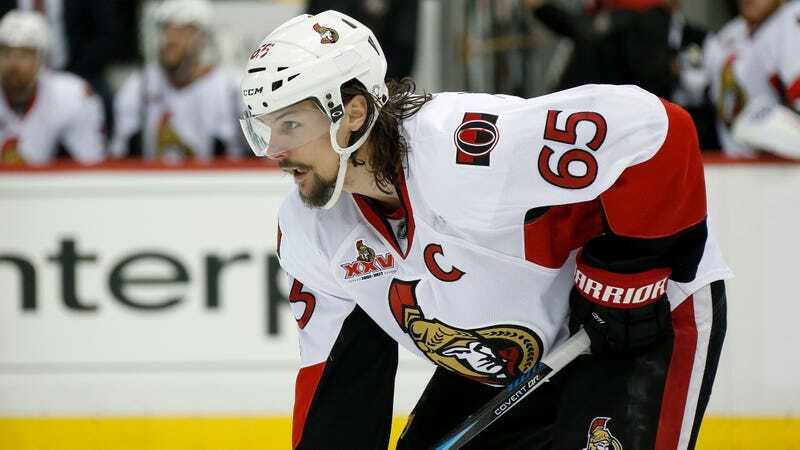 Karlsson participated in his first practice of the season on Wednesday, after undergoing surgery in June to repair multiple fractures and multiple torn tendons in his left foot. (He played through the damage in the playoffs, and despite being in visible pain, he was still a force. He’s incredible.) Afterward, he revealed the extent of the repairs and the recovery: He is now the proud owner of an artificial tendon, he is missing half of an ankle bone, and he was forced to spend all summer off his feet. Karlsson wore a non-contact jersey for the practice, and was “noticeably short on breath” when addressing the media, but he is going to be back, possibly as soon as a few games into the season, which begins next week. But is he going to be the same player? As flagged by The Athletic’s Justin Bourne, these quotes (via the Ottawa Sun and TSN) really do not sound promising. If this were anyone but Erik Karlsson, I’d be side-eyeing these quotes and wondering if Ottawa shouldn’t be very, very worried. Maybe this will be nothing, but also, maybe dude’s foot is fucked up in a way that’s always going to be a problem. But Karlsson in 2013 famously suffered a sliced Achilles tendon that should’ve required four to six months of recovery. He was back in 10 weeks. Karlsson initially said he might not be ready to play until November, but his appearance at practice makes an October debut very plausible. He’s 27 years old, smack in the middle of a defenseman’s typical prime, and we know he’s a fast healer. But for everyone’s sake, his returning to the lineup quickly is immensely less important than his returning to being Erik Karlsson.